Under-Secretary-General for Humanitarian Affairs and Emergency Relief Coordinator, Mark Lowcock (right), visits the Kumchon Cooperative Farm (supported by FAO) in Unryul County, South Hwanghae Province, Democratic People's Republic of Korea. The United Nations is seeking to raise $111 million to meet humanitarian needs in the Democratic People’s Republic of Korea (DPRK), where millions of people face malnutrition, a shortage medicines, and lack of access to safe drinking water, the Organization’s top relief official said on Wednesday. 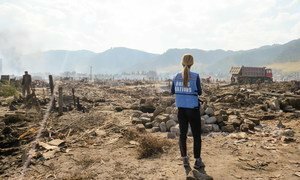 “There is a humanitarian need, we can meet it and we can tell people a convincing and persuasive story about how their money is used if they provide us with more funds,” said Mark Lowcock, the UN Emergency Relief Coordinator, at a press conference held in the country’s capital, Pyongyang. During the visit, he was able to see first-hand both progress that has been made on the humanitarian front and the persisting challenges. “There are though large numbers of people who still need assistance; there is a significant problem of malnutrition with something like 20 per cent of children stunted because of malnutrition which impairs their life chances,” he said. Mr. Lowcock also said that about half of all children in rural areas of the country are not drinking safe water. “Too much of the water is contaminated, which is a cause of disease and threatens the development of too many children,” he said. According to the Needs and Priorities Plan published by the UN a few months ago, $111 million is needed to meet humanitarian needs in the areas of health, water and sanitation, and food security for about 6 million people. “One of things I will be doing when I return to New York in talking to the Member States of the UN is trying to draw people’s attention to the very real humanitarian challenges here, and to say to them that the UN has good programmes, which can save lives, and we have better access across the country for UN staff than we have had in the past,” he said.